A tragedy like the wreck of the Costa Concordia cruise liner “will not happen again,” the shipping line’s boss said Saturday as he unveiled a new luxury vessel to the public. A huge public relations exercise marked the entry into service of the 114,500 tonne Costa Fascinosa, sister-ship of the ill-fated Costa Concordia which ran aground and capsized off northwest Italy on January 13 with the loss of 32 lives. Weeks later another ship from the Costa fleet, the Allegra, was disabled when a fire broke out in the engine room in the Indian Ocean and had to be towed to the Seychelles. Owners Costa Crociere, owned by US giant Carnival Corp., are being sued by scores of the 3,200 passengers aboard the Costa Concordia while prosecutors in Italy are investigating nine people including the captain and three executives. Cruise operators saw their bookings drop after the disaster and have tightened up safety measures, but Costa Crociere boss Pier Luigi Foschi said Saturday reservations were back to their former level. The Costa Concordia accident “should never have happened and will not happen again,” he said, adding that the company was at the “full disposal” of Italian authorities investigating the tragedy. Work on refloating the Costa Concordia will take nine to 12 months before it can be towed away from the Tuscan island of Giglio, a protected maritime area. Announcing the award of the contract to US-owned Titan Salvage, Foschi said last month that environmental protection would have top priority during the operation. Italy’s Tourism Minister Piero Gnudi, who was present at the launch, said credit must be paid to the Costa shipping line, whose behaviour since the Concordia tragedy “has been irreproachable”. 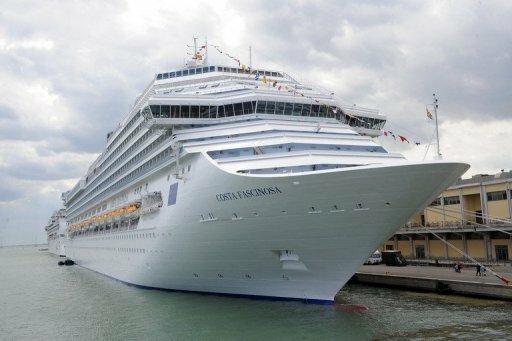 With 17 decks and 290 metres long, the Costa Fascinosa can carry 3,800 passengers and 1,100 crew. The ship cost 510 million euros ($667.4 million) to build, the company said. Tampa Bay Coach Fired! Guy Boucher is Out!